While online events are gaining traction, there still are many reasons to have in-person events. Some sponsors prefer in-person booths, some attendees enjoy the chance to leave the office for a few days, and other reasons. However, you may still want the opportunity to reach a larger audience – sponsors who like the option of online downloads in their booths, attendees who prefer to learn from home or their offices, bosses who don’t want to pay for travel costs. You can combine the two very successfully to get the best of both worlds. Here are a few of our tips to do so. To make the online attendees feel like they’re really a part of the action, live stream your presentations during the in-person event. You can do this using any number of applications, such as YouTube Live (which now has taken over Google Hangouts), LiveStream, etc. Anything that gives you a live stream link will work successfully. Make sure that you have a good quality camera (a GoPro or a good smart phone camera will both work great) and that your audience can see both the slides and the presenter’s face. 2. Make the slide decks available online. the back of the room and forgot their glasses or they simply follow along better when they have the slides in front of them on their computer, always make sure you have slides available. This will be great for after the live portion of the event as well. Those who attended the sessions live will like having the deck to refer to in the future and those who missed the session will be able to look back and see what they missed. see all of the content live. Your in-person attendees will be excited about the opportunity to be able to catch the presentations that they missed, and your online attendees will be more likely to view all of the presentations at their leisure. You can do this a couple of different ways. Your speaker/presenter can have an online chat room that they can refer to during the Q&A with the in-person crowd, so that they answer questions from both audiences; alternatively, you can ask your speaker to answer questions from the online audience after the event using a chat room. Either way, you’ll want your online audience to feel as much a part of the action as your in-person crowd. In-person attendees tend to try to catch the speaker after they are finished with their presentation, whether by the stage or in the lobby afterwards. Your online event audience does not have that opportunity, so you need to make sure that they have the option to ask their questions as well. You have more sponsor real estate, so to speak, utilizing in-person and online events simultaneously. It’s quite easy for sponsors to send you materials for an online booth – typically online downloads, links to their site, online giveaways, and graphics. This opens up a lot of opportunities for different kinds of sponsorships. Your in-person sponsors may want to have both virtual and physical booths as well. You should approach them and see if they would be interested in having an online and a physical presence at your event. Keeping these few tips in mind, you can have a truly successful online event to accompany and broaden the audience for your in-person event! Have any questions? 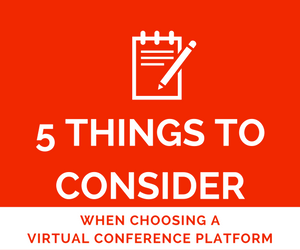 Send me an email at caitlin@vconferenceonline.com and I’ll be happy to help out! A question people are always asking is, “How do you profit from _____?” The entire point of marketing, digital or otherwise, is always trying to turn a profit. That’s the point of selling products or services, right? Focus on your content and how it will help people. That sounds cheesy and it probably is. After all, we don’t give our services and products away; we sell them! Why wouldn’t we focus on the money we ought to be getting for what we sell? Customers are more annoyed with marketers than ever. They fast-forward through commercials, ignore banner ads, and generally just scoff at any kind of advertising ploys we try. They’ve seen our tricks plenty of times and they’re tired of it. This is where content marketing, digital marketing, and so many other kinds of marketing become frustrating for all parties. This is why you should focus on your content. If someone sees your content, understands that you’re trying to help them achieve some goal, they are much more likely to want to buy your product or service, because they know that you can really be an asset to them. Stop trying to focus on your profits – though don’t sell yourself short. However, if you focus on helping people, they will see your intentions and like you more for it – and that is where the profit comes.